of The Text This Week. Greek Interlinear Bible, ScrTR, ScrTR t, Strong, Parsing, CGTS, CGES id, AV. The Blue Letter Bible. KJV, alternate versions, Greek text with concordance, commentaries. The World Wide Study Bible includes commentary & sermons. The Five Gospels Parallels, John W. Marshall, University of Toronto. Primary texts (Pseudepigrapha, Targum, Midrash, Targum) about Messainic Expectation from (Rutgers University Dept of Religion) Mahlon H. Smith's Into His Own: Perspective on the World of Jesus companion to the historical study of Christian texts. Commentary on a Harmony of the Evangelists, John Calvin, 1558: Luke 2:22-32, Luke 2:33-39. "Christ, upon whom all our sins were laid, being offered to God according to the law purifies both Mary and us all in himself." From Matthew Henry's Commentary (c. 1700). "The same Spirit that provided for the support of Simeon's hope, provided for his joy. Those who would see Christ must go to his temple." From Wesley's Notes. John Wesley (1703-1791). "And the revival of the spirit of prophecy, together with the memorable occurrences relating to the birth of John the Baptist, and of Jesus, could not but encourage and quicken the expectation of pious persons at this time. Let the example of these aged saints animate those, whose hoary heads, like theirs, are a crown of glory, being found in the way of righteousness." From the Commentary on the Whole Bible (Jamieson, Fausset and Brown, 1871). "From the intermediate offering of "a pair of turtle doves or two young pigeons," we gather that Joseph and the Virgin were in poor circumstances (2Co 8:9), though not in abject poverty." From The People's New Testament, B.W. Johnson, 1891. "The utterances of Elizabeth, Mary and Simeon are consecutive. Each begins where the other ends. Mary sings her own born Messiah; Zacharias celebrates the triumph of Israel, and Simeon announces the hopes of the Gentiles. But, besides this holding forth the Messiah as a Savior for Gentile as well as Jew, what is remarkable is, that he announces in Jesus a suffering Messiah as well as a glorious.--Whedon." Commentary, Luke 2:22-40, Stephen Hultgren, Preaching This Week, WorkingPreacher.org, 2014. "Jesus will be the cause of many rising and falling in Israel -- he will be both the stone upon which some stumble and the stone of salvation (Romans 9:33; 1 Peter 2:6-8). In any case, Luke's account certainly gives credence to Paul's claim. The dedication of Jesus to God at the temple sets Jesus on the way to his work of redemption." Carols of Thanksgiving and Lament, David Lose, ...in the meantime, 2014. "Just Praise," Karoline Lewis, Dear Working Preacher, 2014. "A famous preacher was once asked, "Who, besides yourself of course, do you think is the best preacher in the country right now?" This very famous preacher responded immediately and succinctly, 'You. Because you are the only one who knows what your congregation needs to hear.'" "Love," "Simeon," sermon discussion from Frederick Buechner, Frederick Buechner Blog. "And rise we shall, out of the wilderness, every last one of us, even as out of the wilderness Christ rose before us. That is the promise, and the greatest of all promises." Comentario del San Lucas 2:1-14, (15-20), ClÃ¡udio Carvalhaes, Working Preacher, 2014. Commentary, Luke 2:22-40, Joy J. Moore, Preaching This Week, WorkingPreacher.org, 2012. "Planning for the sermon this first Sunday after Christmas requires intentionality by preachers to thread together the familiar episodes of Christmas Day with the subsequent arrival of peace on earth." "How Are We Caring for Our Children Today?" Susan K. Hedahl, ON Scripture, Odyssey Network, 2012. "...in juxtaposing this text with some of today's facts and realities about children, the Biblical passage slashes across our lives with one harsh notice: 'Warning'!" "The Oddest Christmas Carol," David Lose, Dear Working Preacher, 2012. "So why do we sing about death just a week after our Christmas celebration of life? So that by naming death it may no long terrify or diminish us, as with the coming of Emmanuel, God with us, we need no longer fear...anything." "Simeon's Faithful Proclamation," Lauren F. Winner, The Hardest Question, 2012. "Simeon saw salvation in a very unlikely source." Commentary, Luke 2:22-40, Holly Hearon, Preaching This Week, WorkingPreacher.org, 2008. Luke 2:22-40, Christmas 1B, Comments (commentary) and Clippings (technical notes for in-depth study), Chris Haslam, Anglican Diocese of Montreal. "First Thoughts on Passages from Mark in the Lectionary: Christmas 1," William Loader, Murdoch University, Uniting Church in Australia. "Luke reflects the honouring of wise elderly people. Probably frail and able to achieve little that counts on the scale of the economic rationalists, they are rich sources of wisdom. Congregations often have Simeons and Annas; are they heard?" "Simeon and Anna," Gospel Analysis, Sermons from Seattle, Pastor Edward F. Markquart, Grace Lutheran Church, Seattle, Washington. Detailed background and exegesis. Sermon Preparation Thoughts and Questions by Wesley White, 2006. Exegetical Notes by Brian Stoffregen at CrossMarks Christian Resources. "Perhaps the description of Jesus "growing" (2:40) and "increasing" (2:52) might encourage us to keep growing and increasing in our wisdom and in divine and human favor." "The Childhood of Jesus," study guide for adults, Robert B. Kruschwitz, (other resources at) "Children," Christian Reflection, The Center for Christian Ethics at Baylor University, 2003. "The Jewish Christ of the Underclass," Holy Family, Larry Broding's Word-Sunday.Com: A Catholic Resource for This Sunday's Gospel. Adult Study, Children's Story, Family Activity, Support Materials. "How do people try to hold to the spirit of the Christmas?" "Jesus Grew in Wisdom and Stature," Rev. Bryan Findlayson, Lectionary Bible Studies and Sermons, Pumpkin Cottage Ministry Resources. Includes detailed textual notes. Good News From Israel-Verse Commentary on Luke 2:21-35, Jirair Tashjian, Christian Resource Institute. "The sword of Jesus will divide, discriminate, and judge the thoughts, attitudes, and relationships of all people. Mary the mother of Jesus will go through the same crisis. Everyone must decide what to do with Jesus." Luke 2:22-40, Presentation, Comments (commentary) and Clippings (technical notes for in-depth study), Chris Haslam, Anglican Diocese of Montreal. "Holy Prepuce," "Nunc Dimittis," wikipedia. "Caring as Honoring," Anne E. Streaty Wimberly, (other resources at) "Aging," Christian Reflection, The Center for Christian Ethics at Baylor University, 2003. "Congregations are 'soul communities,' in which young and old are soul-mates, bound together as an extended family of God, who love, support, and sustain one another. They should assure that senior adults are cared for and honored as resourceful contributors to community life, wisdom-givers, exemplars of the faith, and worthy recipients of care. How do we make this biblical vision concrete in our lives?" "God's Call in Later Life," Beth Jackson-Jordan," (other resources at) "Aging," Christian Reflection, The Center for Christian Ethics at Baylor University, 2003. "Many older adults find they are as busy in retirement as they were earlier in life. Though their schedules are full, they may struggle to find a satisfying purpose for this stage of life. How can congregations help us, in our later years, hear a special calling from God?" "Aging with Hope and Wonder," Terry Thomas Primer, (other resources at) "Aging," Christian Reflection, The Center for Christian Ethics at Baylor University, 2003. "While television, radio, and print media champion the young as models of vision, vigor, and imagination, Scripture portrays quite another story." Brown, Raymond Edward, "Presentation of Jesus (Luke 2:22-40)," Worship, 1977. Elliott, J.K., "Anna's Age (Luke 2:36-37)," Novum Testamentum, 1988. Long, Thomas, Living by the Word Lectionary Reflections, The Christian Century, 2014. Neyrey, Jerome H., S.J., "God, Benefactor and Patron: The Major Cultural Model for Interpreting the Deity in Greco-Roman Antiquity," Journal for the Study of the New Testament, 2005. Pohl, Christine D., "Living on Tiptoe," The Christian Century, 2005. Soards, Marion L., "Luke 2:22-40," Interpretation, 1990. Thurston, Bonnie Bowman, "Who Was Anna? : Luke 2:36-38," Perspectives in Religious Studies, 2001. Stendahl, John K., "Holding Promise," The Christian Century, 2002. Strickert, Frederick M., "The Presentation of Jesus: The Gospel of Inclusion: Luke 2:22-40," Currents in Theology and Mission, 1995. Yaqob, Olga, MVM, "The Face of God in Suffering: Iraq," Theology Today, 2006. "The Struggle to Believe," Dr. William L. Self, Day1, 2014. "Joy Comes in the Evening," the Rev. David Lewicki, Day 1, 2012. "A Sight for Certain Eyes," the Rev. Dr. Ozzie E. Smith, Day 1, 2008. "Simeon and Anna," Pastor Edward F. Markquart, Sermons from Seattle, Grace Lutheran Church, Seattle, Washington. "The Gift of Light," the Rev. Roy T. Lloyd, Day 1, 2002. Father Andrew M. Greeley, "Priest, Author, Sociologist," Commentary and Homily, 1999. Faith Formation Journeys, Christmas 1B, childrens sermon, 2012. 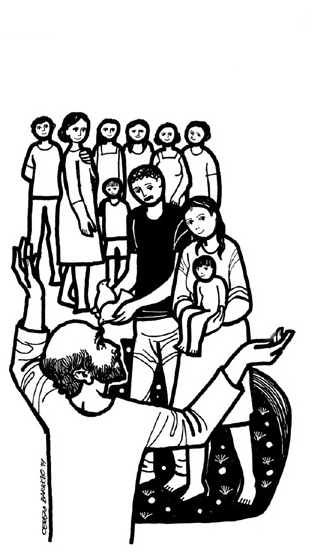 "Simeon and Anna Say Thank You," Illustrating the Story (lessons, children's sermons), coloring pages, activity sheets, crafts, children's songs. MSSS Crafts. "Our God Is Faithful, 100%!" Charles Kirkpatrick, Sermons4kids.com. "Simeon Praises God in the Temple," Sunday School Lessons: Family Bible Study, art projects, music, stories, etc. "Simeon & Anna," children's study, puzzles, coloring sheet, etc. Higher Praise Christian Center. Luke 1 & 2 Word Search Don Crownover's Bible Puzzles. "Anna," Anne E. Curtis, dramatix. "A Hopeful Old Man," from A Certain Jesus by Jose Ignacio and Maria Lopez Vigil. Ideal for catechetical and liturgical dramatization of today's gospel. Claretian Publications. Luke 2:22-40, at Cerezo Barredo's weekly gospel illustration. Liberation emphasis. Clip Art, Julius Schnoor von Carolsfeld woodcuts, World Mission Collection, Wisconsin Evangelical Lutheran Synod. “Lord, Let Your Servant Go in Peace,” an original hymn by Carolyn Winfrey Gillette, inspired by Simeon’s canticle and God’s providence throughout our lives. Tune: ST. PETER 8.6.8.6 (“In Christ There is No East or West”). Hymns with Scripture Allusions: Luke 2:22, 27, 29, 32, 34, 35, 40. The Cyber Hymnal. Hymnal Scripture References, The Lutheran Hymnal, Lutheran Worship.